The Mekong Delta is the vast region in Southeast Vietnam where the Mekong River approaches and empties into the sea. Encompassing almost 40,000 square kilometers of Southeastern Vietnam, the Mekong Delta region is abundant with water, fruit orchards, and most importantly, rice fields. It produces about half of Vietnam's agricultural output and is the best place to experience the timeless scenery of farmers planting and harvesting rice. Mekong Delta is always a “can not be missed” destination for those who once travel Vietnam southward. Especially, now surrounded by very local and simple river life, we also can enjoy luxurious services on board. Bassac, a floating hotel on Mekong River. 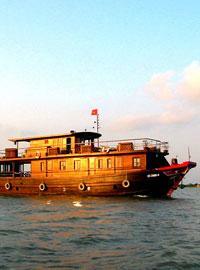 Exotic cruise upstream the Mekong with the a traditional wooden ship. orchards and working farmers along the river banks. At 7:30 hours, picked up at the hotel and driven straight to Can Tho. Boarding at Ninh Kieu pier at noon, start to get acquainted with friendly crew, receiving information of the ship and then check into the cabins. Departure downstream of the Hau River and touring near Tra On floating market. Lunch on board while en route. Branching into Nicolai canal, towards the Mang Thit and Co Chien Rivers. Rest on the upper deck or enjoy the open bar in scenery of rice fields, sugar cane, woods on the near banks. Boarding back, complimentary drink as a welcome back on board. Open bar and rest on the deck enjoying the sunset. The crew will serve dinner while the Bassac is cruising Mang Thit River towards her anchorage point for the night. 06:30 Departure towards Cai Be. The passengers take their breakfast while enjoying the scenery on the banks. The Bassac crosses Co Chien River then branches into Cho Lach canal for 30 minutes through the traffic of sand and rice barges, in a scenery of fruit drying facilities and wooden ship building yards. Arrival in Cai Be, check-out and boarding of a local boat for a tour of Cai Be floating market and handicraft. Transfer back to Saigon and drop off at your hotel. *The above prices are based on the group from 4 - 6pax and valid until Sep, 2008. All prices might be changed subject to your group size and travel period. Some tours have Deluxe Option available. Please contact us for further information. We will stay overnight on board and Bassac Boat offers one type of well -equipped cabins. The Bassac is entirely built of wood in a hull of gỗ sao, the now rare essence of wood used traditionally used for building quality ships. She can accommodate up to 24 passengers in twelve nicely decorated cabins, each with air-con and a private bathroom, and features a 500 sqft restaurant that opens all around, a large galley, a small office room and 1500 sqft of upper deck, mostly covered.